As if Leland Palmer last week wasn’t enough, there’s even more ghosts of television past on this week’s episode of Mad Men. Cory Barker samples Cool Whip in the presence of head of desserts Mr. Belding, as Andy Daglas finds himself propositioned by Rory Gilmore at the train station. Me? I missed the visitors because I was busy listening to the final track on Revolver and paying $250,000 for the privilege of doing so. Just another day at the office for the Barker Chappell Daglas reviewing agency. 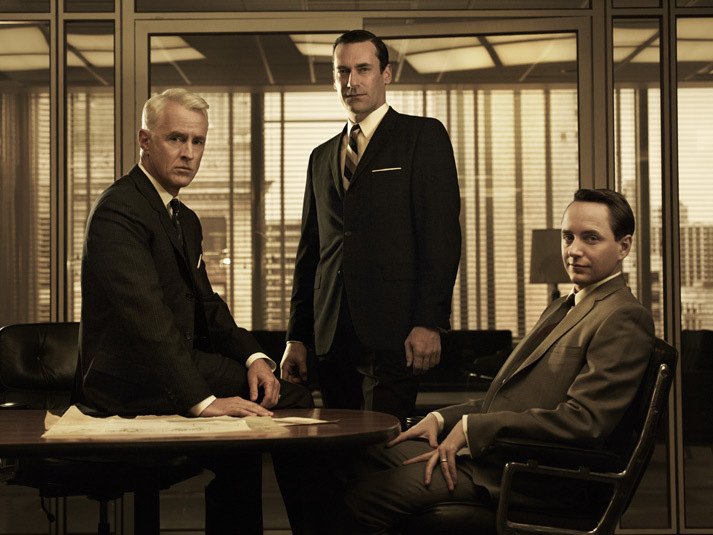 Lots of interesting casting this week on Mad Men, and also plenty of potentially earth-shattering changes as we head to the second half of the season. You can find our discussion of “Lady Lazarus” over at TV Surveillance – check in now before the three of us quit the agency to pursue our dreams of becoming a real-life Three Amigoes. This entry was posted in Back and Forth, Mad Men Roundtable, Mad Men Roundtable Database and tagged Aaron Staton, Alexis Biedel, Andy Daglas, Back and Forth, Barker Chappell Daglas, Ben Feldman, Bert Cooper, Betty Draper, Cory Barker, Dennis Haskins, Don Draper, Elisabeth Moss, Harry Crane, Jessica Pare, Joan Holloway, John Slattery, Jon Hamm, Ken Cosgrove, Kiernan Shipka, Lady Lazarus, Lane Pryce, Mad Men, Mad Men Roundtable, Matthew Weiner, Megan Draper, Michael Ginsberg, Mr. Belding, Peggy Olsen, Pete Campbell, Robert Morse, Roger Sterling, Rory Gilmore, Sally Draper, season five, The Vast Wasteland, Trudy Campbell, TV Surveillance, Vincent Karthesier. Bookmark the permalink.